"Hollyhock" redirects here. For the J. League Division 2 team, see Mito HollyHock. For the streambank wild hollyhock, a related species in western North America, see Iliamna rivularis. Wikimedia Commons has media related to Alcea. Alcea, commonly known as hollyhocks, is a genus of about 60 species of flowering plants in the mallow family Malvaceae. They are native to Asia and Europe. 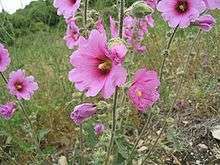 The single species of hollyhock from the Western Hemisphere, the streambank wild hollyhock, belongs to a different genus. Hollyhocks are annual, biennial, or perennial plants usually taking an erect, unbranched form. The herbage usually has a coating of star-shaped hairs. The leaf blades are often lobed or toothed, and are borne on long petioles. The flowers may be solitary or arranged in fascicles or racemes. The notched petals are usually over three centimeters wide and may be pink, white, purple, or yellow. The fruit is a schizocarp, a dry disc divided into over 15 sections that contain seeds. Hollyhocks are popular garden ornamental plants. They are easily grown from seed. Breeds with red flowers attract hummingbirds and butterflies. Cultivars have been bred, especially from A. rosea. They include the double-flowered 'Chater's Double', the raspberry-colored 'Creme de Cassis', and 'The Watchman', which has dark, nearly black, maroon flowers. The stems of hollyhocks can be used as firewood, and the roots have been used medicinally. Alcea species are used as food plants by the larvae of some Lepidoptera species including Bucculatrix quadrigemina and Vanessa cardui, the Painted Lady. The mallow flea beetle (Podagrica fuscicornis) is a pest that makes tiny holes in the leaves. Cutworms, aphids, and capsid bugs use the plant as a food source in hotter and drier conditions. 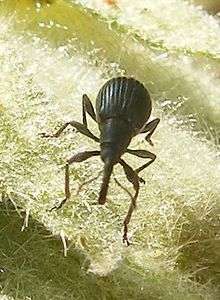 A number of weevils use A. rosea as their host plant, including Rhopalapion longirostre, Alocentron curvirostre, and Aspidapion validum. The plants are also susceptible to the pathogenic fungus Puccinia malvacearum, the hollyhock rust. 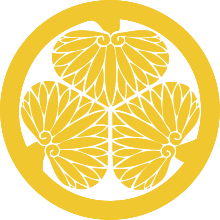 A hollyhock flower, known in Japan as aoi (葵), was incorporated into the official seal (mon) of the Tokugawa shogunate in Japan, and through this influence has maintained importance in modern Japanese culture. For example, it inspired the name and symbol of Mito HollyHock, a professional soccer club in a city formerly led by the Tokugawa family. The Aoi Matsuri (Hollyhock Festival) is one of the three main festivals of the city of Kyoto. During the Victorian era, the hollyhock symbolized both ambition and fecundity in the language of flowers. 1 2 3 4 5 Tang, Y.; et al. "Alcea". Flora of China. Missouri Botanical Garden, St. Louis, MO, and Harvard University Herbaria, Cambridge, MA. Retrieved 24 July 2012. ↑ GRIN Species Records of Alcea. Germplasm Resources Information Network (GRIN). ↑ Hollyhock: A. rosea. Better Homes and Gardens. ↑ Aydin, S.; Öztürk, Y.; Başer, K. H. C.; Kirimer, N.; Kurtar-Öztürk, N. (1992). "Effects of Alcea pallida L. (A.) and Tilia argentea Desf. Ex DC infusions on swimming performance in mice". Phytotherapy Research. 6 (4): 219–220. doi:10.1002/ptr.2650060411. ↑ Wilhelm, G., et al. (2011). Sexual dimorphism in head structures of the weevil Rhopalapion longirostre (Olivier 1807) (Coleoptera: Curculionoidea): a response to ecological demands of egg deposition. Biological Journal of the Linnean Society 104(3) 642-60. ↑ Hollyhock rust. Royal Horticultural Society.